As hard as it may be to believe nowadays, a few years ago the platform game experience was the basis for several different genres, pretty much like the open world experience today. This led to the creation of some very interesting titles such as Prince of Persia, Another World and Flashback which deepened basic platforming gameplay with elements taken from adventure games. Games like this aren’t being developed that often anymore, so when a game like Rise & Shine, a love-letter to the genre, gets released, long time gamers cannot help but be amazed at how compelling this type of experience can be even today. Rise & Shine stars the titular Rise and Shine, a young boy trying to survive the invasion of Gamearth and a legendary gun that can only be wielded by the hero chosen to save the world. Over the course of their intense yet short adventure, the duo will get to travel around Gamearth in search of a way to repel the invaders and restore peace to the planet. The story in Rise & Shine isn’t exactly thrilling, but it’s competently told, with plenty of quirky humor and references to other classic video games which make it enjoyable. There are some twists here and there, but the story is generally straightforward, which is not a huge issue considering this isn’t a narrative-driven game. As already mentioned, Rise & Shine is a love-letter to the adventure-platform games of the 90s such as Another World and Flashback, but the game doesn’t stop at being just that, as there are some very interesting features that elevate the classic formula considerably. 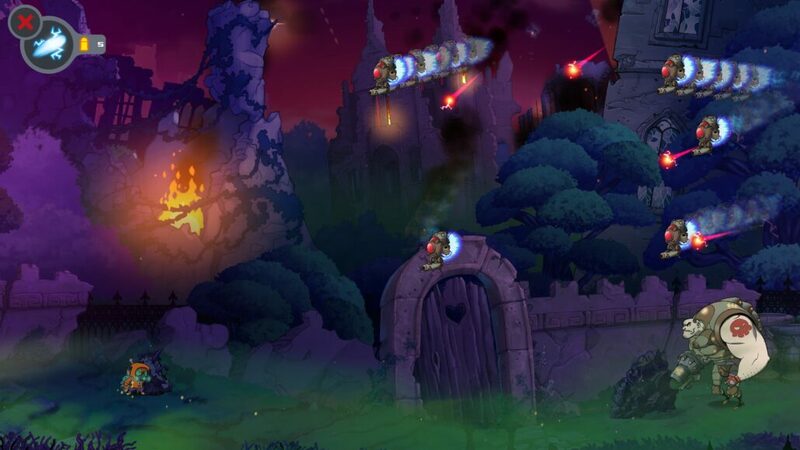 The platforming elements are just a small part of the experience: during the course of the game, players will have to explore a variety of locations in search of some well-hidden secrets, shoot down enemies using different type of bullets, ranging from player-controlled to explosive ones, solve puzzles, challenge their skills in some mini-games centered around the shooting mechanics, and fight against some huge bosses. While these concepts are not new at all, it’s how well their executed that elevates Rise & Shine quite a bit. Combat, for starters, is quite interesting, mostly thanks to the variety of combat scenarios. There will be times where players will have to hide behind cover while fighting waves of enemies, adding some strategic depth to the fighting, times where players will have to use a specific type of bullet and so on. With Rise dying in just a few hits, players will always have to be at the top of their game, even with respawning being as generous as it is. While intense and very engaging, combat does highlight one of the few issues of the game, the shooting controls on a gamepad. To be able to shoot, players need to keep the left trigger pressed while aiming with the right stick and shooting with the right trigger. It took me a while to get used to this control scheme, and I never felt truly comfortable with it. With the left stick only being used to aim throughout the game, I do not see the need to having to press an additional button in order to shoot. Things can be better with keyboard and mouse, so there’s at least an option for those who share my feelings on the gamepad controls: with late game fights being quite intense, having good accuracy is very important, and pad controls may be getting in the way. Combat isn’t the only gameplay element that’s quite enjoyable in Rise & Shine, as exploration and puzzles are just as good. Super Mega Team definitely needs to be praised for their creativity, as no location nor puzzle in the game feels the same. Some sequences are especially interesting, as they spin the basic experience around to offer something noticeably different, such as a survival-horror like sequence where players have to deal with some very tough zombies, bullet-hell like sequences and a side-scrolling shooter sequence in the vein of classics like Gradius and R-Type, just to name a few. In a world called Gamearth, a celebration of classic video games is to be expected, and the way these sequences flow into one another without feeling out of place is quite remarkable. Boss battles also deserve to be mentioned. While few, these encounters are definitely among the highlights of the game, requiring players to uncover their weak spots by complete certain tasks destroying smaller enemies, hitting the boss repeatedly while avoiding deadly attacks and so on. The so-so shooting controls on gamepad can make late game bosses a bit frustrating so expect to die a few times if you haven’t mastered them. Rise & Shine doesn’t just play great, it looks and sounds just as nice. The game sports a hand-drawn 2D style that looks impressive in motion, with little to no slowdowns even when the action becomes chaotic. The soundtrack includes a good mixture of atmospheric and more intense pieces that accompany the on-screen action appropriately. At the end of the day, I thoroughly enjoyed my first Rise & Shine playthrough and I was left hungering for more, as it the game is less than 4 hours on the basic difficulty level. The platform game developed by Super Mega Team is a good example on how to modernize a classic gameplay formula without going overboard, making each addition a coherent part of the whole experience. 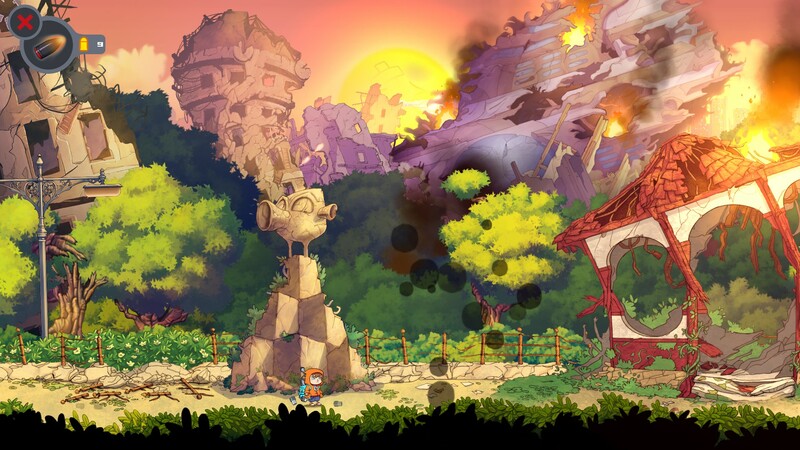 Influenced by adventure-platform games of the past, Rise & Shine manages to enrich a classic gameplay formula with a tight mix of different genres, interesting combat depth, and varied puzzles. Shooting controls can be a bit uncomfortable on a gamepad, but this is the only gripe in a game that's objectively very well put together. Highly recommended to fans of Another World and Flashback as well as to those looking for a quirky and fun experience that doesn't overstay its welcome. ... which comes way too soon.